A pre-Christmas debut is on the cards for Black Caviar's little sister Belle Couture following her win in a jump-out at Flemington. Trainer Danny O'Brien will monitor the filly's progress from Friday's hit-out and make a decision next week on whether the high-profile three-year-old needs another jump-out before her racetrack debut. But he predicts he will be taking her to the races this month. "We'd certainly be expecting her to run before Christmas," O'Brien said. Belle Couture settled about fourth in Friday's jump-out before Damien Oliver allowed the three-year-old to improve around the turn. The half-sister to Black Caviar went on to win by about hal-fa-length. O'Brien was pleased with the progression Belle Couture made from her first public outing in a jump-out two weeks ago when she finished second. "It was only her second ever jump-out but she jumped a lot cleaner today, travelled nicely and stretched out well down the running," O'Brien said. "Damien gave a really good report and said she was going the right way mentally, and she has just taken a good step from what she showed here two weeks ago. We're getting close to the races I would say." 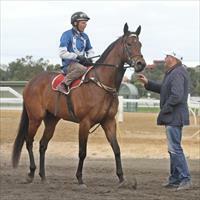 There will be plenty of attention on the daughter of Redoute's Choice out of Helsinge when she steps out to race and it appears the filly will make her debut at an out-of-city track. "I would imagine we would probably just give her an easy kick-off somewhere, one of the country tracks in a maiden," O'Brien said. "Just to get it all right because she still hasn't done a lot. She's a filly that we've obviously been very kind on as a two-year-old and she's still a fair way behind as far as education and everything."